So you've learned how to make glitter text and you want to add your name to a graphic that is already made. We are going to add the text graphic we made with the Glitter Text Tutorials and use a static graphic to add our text to. First find the graphic you would like to add your text to, open it in Animation Shop. Some say that your graphic should be transparent for best results, but that is just because they are not too sure how to make the graphic transparent before adding the text. Your next step is to create a new animation in Animation Shop (File then New), 300X300 should do fine, we will crop it all in the end. With practice you will learn just what dimensions you are going to need in order to create your graphic. I always begin large and then crop when I am done, that ensures me that I won't need to go back and make the graphic larger. Right click on your graphic you opened already (here it is the rose) and choose copy, then right click in your animation and choose paste into selected frame. Move your cursor until you have placed your graphic exactly where you want it. 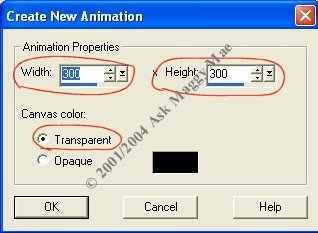 Your next step is to right click on the new frame and choose copy and then twice you will right click and paste after current frame. 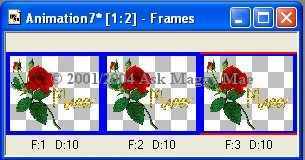 You will then have 3 identical frames as shown below. You now want to open your text graphic that you made in the Glitter Text Tutorial. When it is open choose edit and then select all from your menu, then edit and copy from the menu. Next go to your new animation, click on it and then choose edit and select all from your menu. And finally choose edit and then paste and into selected frame. This will paste all of your text frames into all of your graphic frames. Finally crop your image so that you have removed all excess space from the animation. It will appear as shown below. Now save your new animation. You will naturally add more frames if your text has more than 3 frames to it. It is slightly harder to add animated text to an animated graphic, but it is nowhere near impossible. I will cover this in another tutorial.